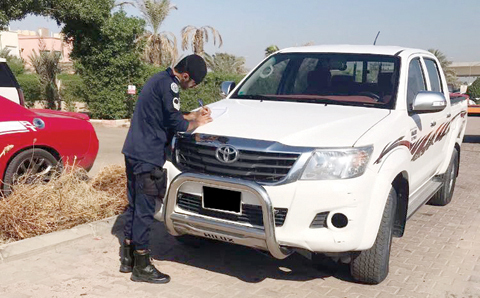 KUWAIT: A high ranking security source said acting Interior Ministry Assistant Undersecretary for Traffic Affairs Maj Gen Fahad Al-Showai presented a proposal to Deputy Premier and Interior Minister Sheikh Khalid Al-Jarrah Al-Sabah that calls for the deportation of any expat who commits five grave traffic violations – be it in one instance or separately. The proposal allows an expat to commit a maximum of four violations in five years, but if a fifth is committed, the person will not be able to renew his residency permit and will be deported. If less than five violations are committed in five years, they will be dropped at the end of this period. This will happen every five years. The source said grave violations included in the proposal include not using seatbelts, using mobile phones, parking on pavements, parking in pedestrian areas and obstructing traffic. The source said this proposal came as the traffic department noticed that there is great disregard of traffic rules by expats, to a point that some of them commit grave violations and do not respect the law, so it was necessary to take deterrent measures against them. The source said the proposal, if approved, will be implemented on all expats without exception, adding that a settlement of grave violations will not spare the deportation punishment. Even if the expat receives an innocent verdict by the judiciary, the violation will remain in interior ministry records. The source said the proposal will not be implemented retroactively, Al-Anbaa daily reported yesterday.